Abner Henry Pinney from the collections of the Worthington Historical Society (WHS) may be used for educational purposes as long as it is not altered in any way and proper credit is given: "Courtesy of the Worthington Historical Society, Worthington, OH." Prior written permission of the WHS is required for any other use of Abner Henry Pinney. Contact WHS at info@worthingtonhistory.org to request permission. Abner Henry Pinney is an art original, with genre portraits. Its dimensions are 24 in x 18 in. Pictured here is a portrait of Abner Henry Pinney (b. December 5, 1805 - d. October 21, 1857). He was born and raised on his father's farm located northwest of Worthington in Delaware County. His father, Albert Putnam Pinney, was a member of the Scioto Company. Following Abner Henry's marriage to Anne Cynthia Strong (b. March 21, 1803 - d. June 24, 1884), he moved to Worthington where he operated a store and resided at 12 East Stafford Avenue. 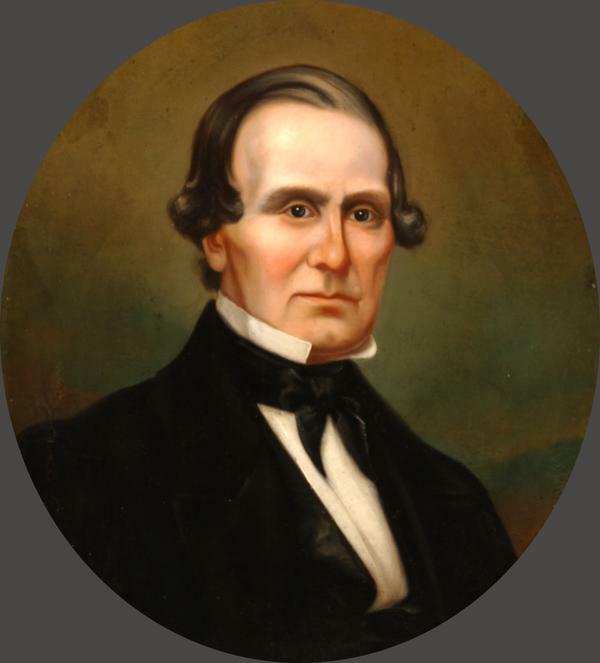 He served as a council trustee for the first village council after its incorporation in 1835. Abner Henry Pinney and his family relocated to Columbus in 1837, where he began a farm tool manufacturing company. The family later moved to Michigan, but returned to Worthington after his death in 1857. His widow taught school and operated a 75 acre farm with her sons. It covers the topics art, businessmen and public trustees. The Worthington Memory identification code is whs0783. This metadata record was human prepared by Worthington Libraries on September 10, 2002. It was last updated November 17, 2017.